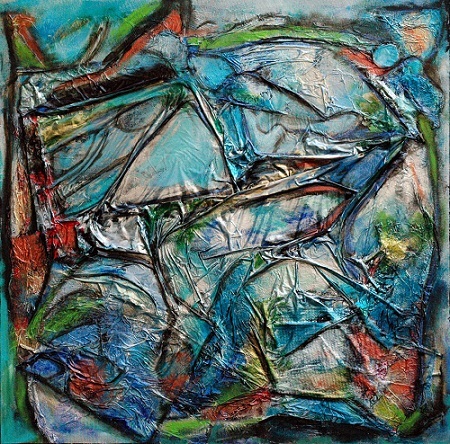 Chasing Night Sky 2, mixed media, 30" x 30"
Carol Whipple (aka "Coco") holds a Master of Science Degree in sociology from Oklahoma State University. She provides experiential workshops and keynote talks in the areas of family, self care, Enneagram, healing, humor, and creative process. Currently, she is the House Mom to sixty-five amazing Chi Omega women at Iowa State University in Ames, Iowa. In her quiet time, Carol paints, draws, does photography, and swims daily. Most of her art is mixed media with acrylic paint, and she often incorporates garbage and packing materials that she finds. Carol was awarded a Kentucky Foundation for Women "Artist in Residence for Visual Arts" in the summer of 2012. The artist writes, "Social change begins at the level of the individual. Each human being needs an understanding of his or her own heart and mind, for the mind is called often to defend the things of the heart. The creative process helps us break through artificial barriers and societal constructs to bring forth energies not geared toward making a living, but toward living authentic lives. My art is about breaking through the garbage. People say I'm too pragmatic, but look at the abstract, at times whimsical, colors and textures!"